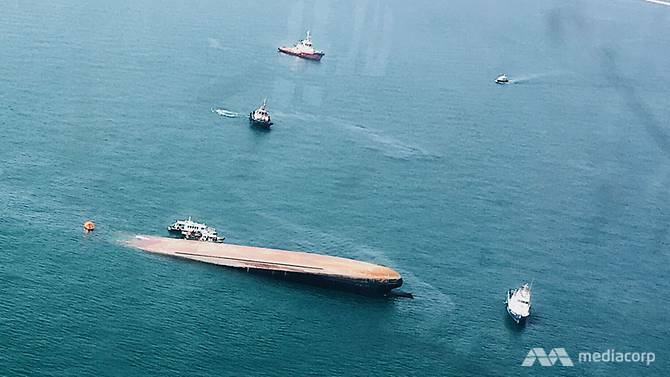 The search and recovery operations for the missing crew members following the collision between a dredger and a tanker in Singapore territorial waters on Sep 13 have concluded, said the Maritime and Port Authority of Singapore (MPA). In a statement on Friday (Nov 10), the authority said the body of the last missing crew member of dredger JBB De Rong 19 was found and identified on Nov 5. The body was found inside the accommodation structure of the dredger by divers during salvage operations, MPA said. As all 12 crew members on board the vessel are now accounted for, with seven rescued and five bodies recovered, search and recovery operations have concluded, MPA added. The Dominican-registered dredger collided with the Indonesian-registered tanker Kartika Segara about 1.7 nautical miles south-west of Sisters’ Islands at about 12.40am on Sep 13.